For most of our nation’s history, individual taxpayers rarely had any significant contact with federal tax authorities, and of course, a personal income tax levied by those authorities has only existed for the last 100 years. 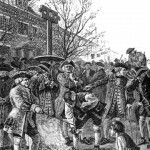 Prior to the Revolutionary War, the Colonial Government was far less centralized than that which would follow after the war, and had a limited need for revenue. Consequently, each of the individual colonies had greater responsibilities, and thus greater (yet differing) revenue needs. The Southern Colonies primarily taxed imports and exports. Central Colonies occasionally imposed a property tax and levied a “head” (or poll) tax on each adult male, while the New England Colonies raised revenue through real estate, excise, and occupation taxes. Stamp Act stamp was required to be affixed to any deed or will, contract, bill of sale, or other such documents, before they could be legally binding. As time went on, England’s need for revenues to fund its wars against France led it to institute a series of taxes on the American Colonies. In 1765, the English Parliament passed the Stamp Act, which was the first of these mandatory taxes. Soon after, Parliament imposed the infamous tax on tea. Even though colonists were forced to pay these taxes, they lacked representation in the English Parliament. This led to the rallying cry of the American Revolution that “taxation without representation is tyranny,” which established the persistent wariness of taxation as part of our culture. 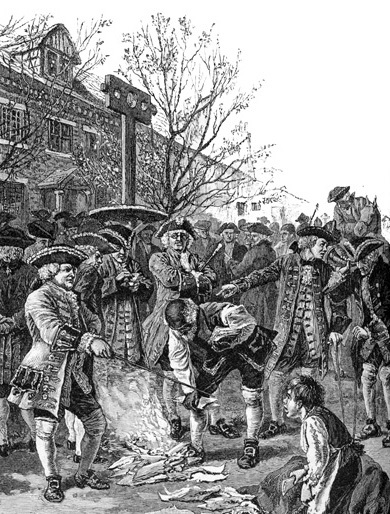 Protests of the Stamp Act. British soldiers destroy non-stamp documents in order to enforce the Stamp Act. In 1781, the colonists adopted the Articles of Confederation, which reflected our Founders’ fears of a strong central government. The states retained much of the political power, with a weaker central confederation (not federation). The central government had few responsibilities and no national tax system, instead relying on donations from the states for its revenue. Under the Articles, each state was a sovereign entity and could levy taxes as it pleased. However, when the current federal constitution was ratified in 1789, the new central government was granted the authority to levy and raise taxes. 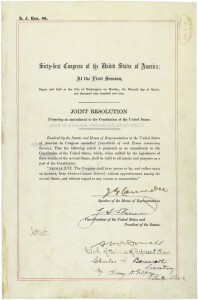 The United States Constitution empowered Congress with the authority to “lay and collect taxes, duties, imposts, and excises, pay the Debts and provide for the common Defense and general Welfare of the United States.” One of the first mandates by Congress was to impose excise taxes on certain goods, to satisfy the debts incurred by the colonies during the Revolutionary War. These taxed items included distilled spirits, tobacco and snuff, refined sugar, carriages, property sold at auctions, and various legal documents. Ever on guard against the power of the central government eclipsing that of the states, the collection of the taxes was left as the responsibility of the state governments. With the ratification and adoption of the US Constitution, the early Americans of the various colonies now had proper democratic representation. Yet, many still opposed and resisted taxes they deemed unfair or improper. In 1794, a group of farmers in southwestern Pennsylvania physically opposed the tax on whiskey, forcing President Washington to send federal troops to suppress what came to be known as the Whiskey Rebellion. This government action established the important precedent that the federal government, not the state, was determined to enforce its revenue laws. The Whiskey Rebellion also confirmed, however, that the resistance to unfair or high taxes, which led to the colonies’ assertion of independence, did not evaporate with the forming of a new, representative government. Interestingly, it should be noted that George Washington had the largest whiskey distillery in the US at the time. “Famous Whiskey Insurrection in Pennsylvania”, an 1880 illustration of a tarred and feathered tax collector being made to ride the rail. Source: Wikepedia. In accordance with the US Constitution, most of the federal government’s tax revenues were derived from excise taxes, tariffs, and customs duties. During our confrontation with France in the late 1790s however, the federal government imposed the first direct taxes on the owners of houses, land, and estates. The term “direct tax” was coined to refer to a recurring tax paid directly by the taxpayer to the government based on the value of the item being taxed. The issue of direct taxes versus indirect taxes played a crucial role in the evolution of federal tax policy in the following years. 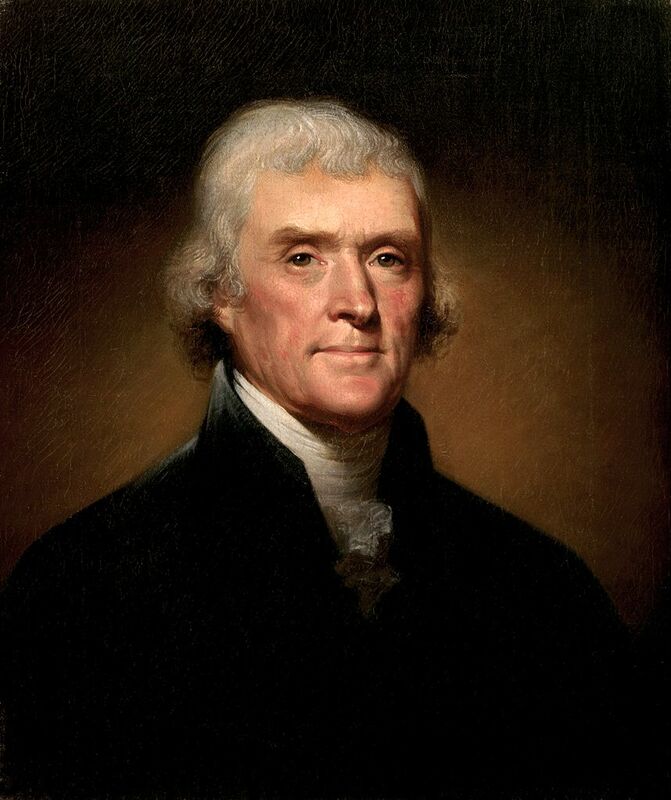 When Thomas Jefferson was elected president in 1802, direct taxes were abolished, and for the next 10 years there were no internal revenue taxes other than excises. To raise money for the War of 1812, Congress imposed additional excise taxes, raised certain customs duties, and issued Treasury notes. In 1817, Congress repealed these taxes, and for the next 44 years the federal government collected no internal revenue. Instead, the central government received most of its revenue from high customs duties and through the sale of public land. The first small hint of an Internal Revenue Service began in July 1862, during the Civil War. President Abraham Lincoln and Congress created the office of Commissioner of Internal Revenue and enacted a temporary income tax (the United States’ very first income tax) to pay war expenses, called the Revenue Act of 1862. It was passed as an emergency and temporary wartime tax, and mirrored a relatively new British system of income taxation, instead of trade and property taxation. The initial rate was three percent on income over eight hundred dollars, which exempted most wage-earners. Later that year, the rate changed to three percent on income between six hundred dollars and ten thousand dollars, and five percent on income over ten thousand dollars. In 1864 the rate was increased to five percent on income between six hundred dollars and five thousand dollars, 7.5 percent on income between five thousand dollars and ten thousand dollars, and 10 percent on income ten thousand dollars and above. By the end of the Civil War, 10 percent of Union households had paid some form of income tax, and the Union raised 21 percent of its war revenue through income taxes. After the war, reconstruction, railroads, and transforming the North and South war machines back to their peacetime footing required public funding. In 1872 however, seven years after the conflict’s termination, lawmakers allowed the temporary Civil War income tax to expire. This granted Congress the authority to impose an income tax without regard to apportionment among the states by population. 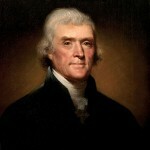 Of the forty-eight states existing at the time, forty-two ratified the Amendment. Connecticut, Rhode Island, and Utah rejected it. Pennsylvania, Virginia, and Florida disregarded the issue. Instructions from the first Internal Revenue 1040 form, dated 1913, showing that only those with incomes of three thousand dollars or greater were instructed to file. Adjusted for inflation, this threshold would be equivalent to about sixty-eight thousand dollars in 2011. 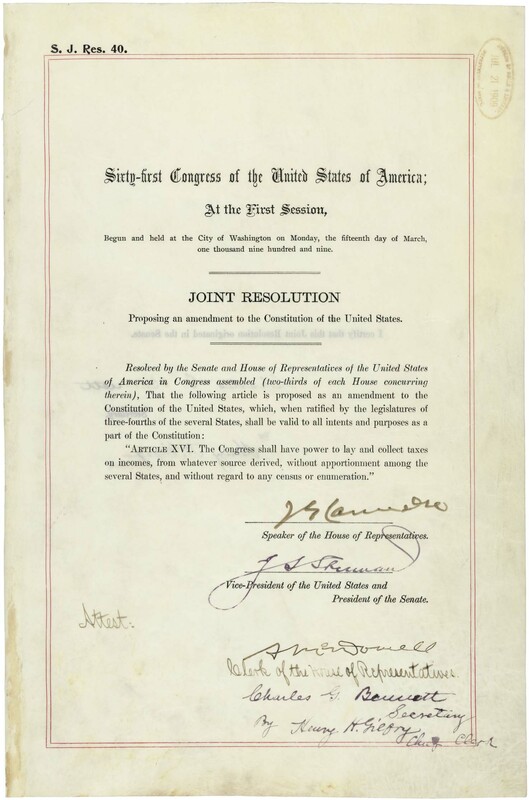 This amendment ratification resulted in the creation of the Bureau of Internal Revenue. 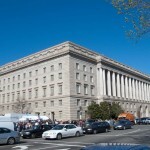 As early as 1918, the Bureau of Internal Revenue began using the name Internal Revenue Service on at least one tax form. In 1953, the name change to Internal Revenue Service was formalized in Treasury Decision 6038. In the 1980s, the agency saw a major reorganization. A bipartisan commission was created with several mandates, among them to increase customer service and improve collections. Almost 20 years later, Congress enacted the Internal Revenue Service Restructuring and Reform Act of 1998. As a result, the IRS now functions under four major operating divisions: the Large Business and International Division, the Small Business/Self-Employed Division, the Wage and Investment Division, and the Tax Exempt & Government Entities Division. The IRS also includes a criminal law enforcement division known as the Criminal Investigation Division. As time went on, more and more taxes have been imposed and levied upon United States citizens, and we continue to protest. 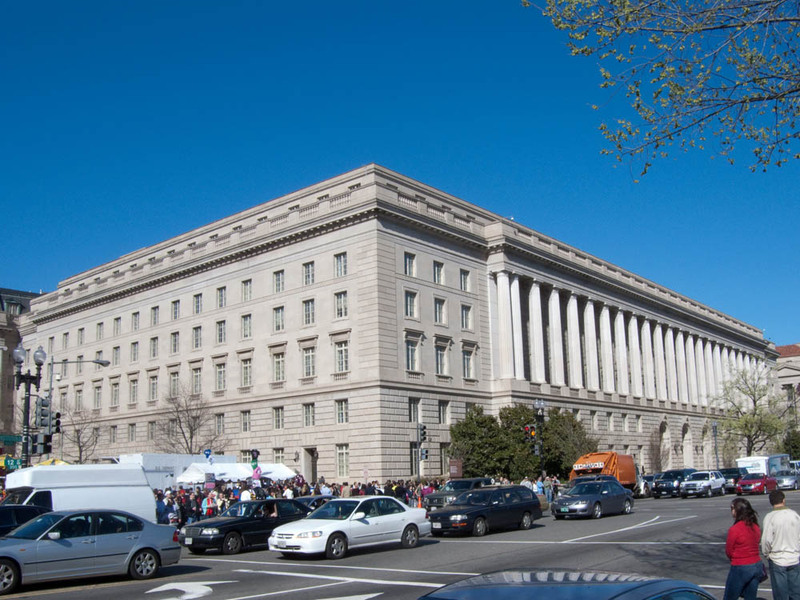 Below are some photographs of the “Audit the IRS Rally” that took place in Washington D.C. on June 19, 2013. The American spirit of opposition to taxation without representation is alive and well. Our Government Feeding On Us. The “Audit the IRS Rally” in Washington DC on June 19, 2013. Internal Rotten Scoundrels. The “Audit the IRS Rally” in Washington DC on June 19, 2013. Bench protesters at the “Audit the IRS Rally” in Washington DC on June 19, 2013. Captain America at the “Audit the IRS Rally” in Washington DC on June 19, 2013. Protesters gather on the lawn at the “Audit the IRS Rally” in Washington DC on June 19, 2013. Don’t Tread On Me protester at the “Audit the IRS Rally” in Washington DC on June 19, 2013.